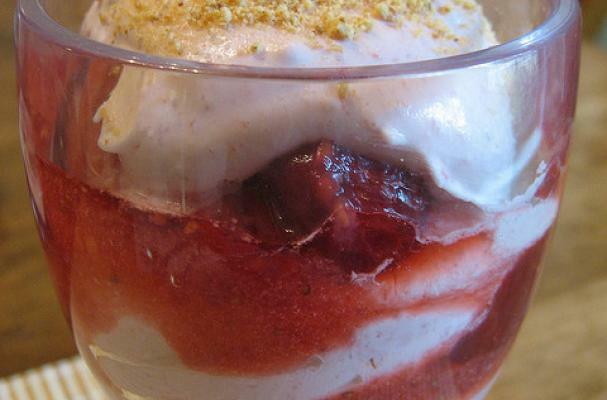 This raspberry fool recipe is the hardest dessert you'll ever make...just kidding, fooled ya! It's actually very easy to make and can be whipped up (literally) in just 20 minutes. Sweetened (and sometimes flavored) whipped cream and fruit puree are layered into beautiful glass bowls. You can use fruit preserves or puree fresh or frozen fruits in a food processor or blender (don't forget to stain the seeds!). Serve this simple dessert with a buttery cookie and a sprig of mint. Gently rinse berries. Set aside a few of the best raspberries for garnish. If using frozen, allow berries to thaw first. In a medium bowl gently toss berries with sugar, liqueur, and lemon juice. Let sit for 20 min. Put berry mixture in a blender or food processor and whirl until smooth or simply use a large fork to mash them a bit. Set aside. In a large bowl beat cream until soft peaks form. Gently fold berry mixture into cream until evenly distributed. Spoon into serving dishes (wine glasses work well), top with reserved berries for garnish, if you like, and serve immediately or keep chilled up to 1 hour.